When it comes to tablets for the little ones, you can be sure that the name LeapFrog would, well, leap into your mind, pardon the reference. They have, after all, rolled out their fair share of tablets in the past that target children, with a robustness to match, and the LeapFrog Epic is the latest model from them to hit the market, as it comes with special play and learning experiences that have been designed to adapt as a child grows up – in other words, to maximize the lifespan of the device. What makes the LeapFrog Epic stand out from its predecessors? Well, apart from sporting a vast number of award-winning learning content plus amazing new interactive features to an Android-based consumer electronics tablet, it will, for the first time, offer children different methods to explore safely, play, imagine and create like never before. The LeapFrog Epic tablet was specially built from the ground up in order to adapt as a child grows, where one can access unique personalized learning experiences which auto-level with a child’s progress; an amazing first-of-its-kind, customizable, interactive, playable home screen; kid-safe browsing right out of the box which will adjust accessibility as a child is ready; in addition to easy-to-use parental controls that assist and define the play experience for each individual child. The LeapFrog Epic tablet will run on the Android 4.4 KitKat operating system, where it is powered by a quad-core processor, a brilliant seven-inch multi-touch capacitive LCD screen, front and back camera, video recording capability, 16GB of internal memory and a battery that will be able to run for half a dozen hours before requiring a recharge. If you do not want it to look all that bulky and unwieldy, you are able to remove the included kid-safe bumper and untether the stylus, hence upping the cool factor by another notch so that it is more in line with that of your professional looking adult tablet. 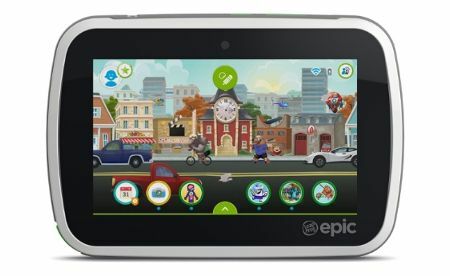 The LeapFrog Epic tablet will retail for $139.99 a pop, where it will cater for children aged three to nine years old.